[May 11, 2014] Probably more than any other leader, Napoléon Bonaparte is the worldwide cultural icon symbolizing military genius and political power. His military and political achievements are studied for their audacity and brilliance. So, what was it that set Napoléon apart from other senior leaders? That question is the main reason why I chose to profile him here. 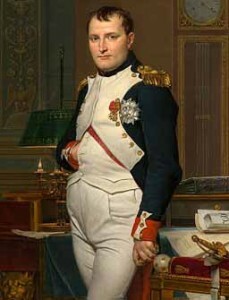 Napoléon was extraordinarily successful in both the military and political spheres of influence and in his achievements. Napoléon is best known for his role in the wars led against France by a series of coalitions, the so-called Napoleonic Wars, which involved every major European power. Eventually, he established hegemony over most of continental Europe and sought to spread the ideals of the French Revolution. In this respect, he is often compared to Alexander the Great. Politically, Napoléon instituted reforms in France that have endured to this day: the metric system, centralized government in France along that the idea that bigger is better, a regulated tax code, and a central bank. His legal reform, the Napoleonic Code, has been a major influence on many civil law jurisdictions worldwide. Napoléon was the best military leader of the 19th Century. His ability to help save France from outside attacks and stabilize it politically was a further mark of his genius and true senior leadership ability.